Our hearts were telling us to be selfish, but her sweet golden eyes were telling us something very different. Our beautiful Cami has passed away tonight, and although our hearts are broken, and as much as our heads are spinning with grief and the sense of loss, we take great comfort in knowing our touch and our love was the last thing she took with her as she crossed over. It was an honor to be with her in the end, and to be able to connect deep into her loving eyes. The eyes of a beautiful, gentle, soul, peacefully slipping away. We will miss you forever sweet Cami, but you are home now. Run Blondie, run free and find your place at the head of the NJ Beagles pack, and lead those of ours who crossed before you. Annie, Willie, and Honey Buns will miss you terribly but we know one day you will be standing at the other side of the bridge ready to greet them as they arrive. Terry - I saw your recent posting, and my heart aches for you. Each of our loved ones , including our furry loves, has a piece of our heart the is his/her own. When the one we love has gone, the sorrow envelops us . As time passes, the grief lessens, but we know some sense of it will remain until we are reunited. I'm reminded of the quotation "Love has no measure, and pain has no end." Thank you Brenda. You always seem to have the right words to make someone feel better, although I did cry first. I sent you an email after your first post. I never heard back from you so I'm not sure you got it, but I wanted to let you know how much I appreciated your post. Thanks again! I think of you everyday Cami... I miss you so much that sometimes I just can't stop the tears from flowing. Time is supposed to heal all wounds, but so far, it's not working. I miss you my sweet and gentle Cami Girl. Over the years I came to know Cami, saw the beautiful videos of her with her litter and new puppies, and my tears are running ..... Our Peppi Beagle is 13 years old and going strong but our little Jackrussel girl Fritzi (we found her dishevelled and lost and no one claimed her so we took her in on April 29, 2002) passed away in October 2013, in my arms. She probably was over 17 years old and the sweetest little creature. Everything in our home reminds me of her, and I hope we will have Peppi with us for a long time. RIP, Cami! Clicked on the button last week, saw the picture, and the tears came. I never met Cami, but it feels as if I did. 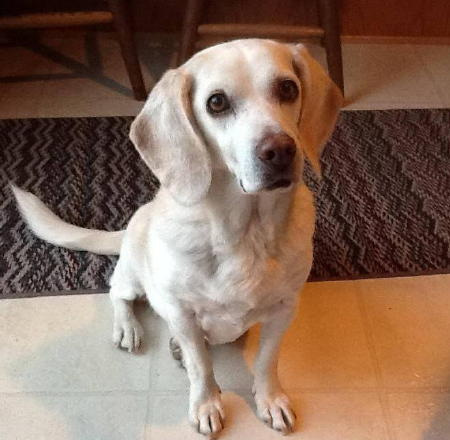 She and the other New Jersey Beagles -- Cutie Pie, Belle, and Powder, to name a few -- were the "virtual pack" of beagles who comforted me after I lost my beloved beagle Wiley in May 2005. I became addicted to the website and the stories of puppies and courtships and breakouts and whatever. Each posting from Terry brought a story that gave me a beagle fix that helped with the grief. Cami was a sweet mother who loved her puppies, each one as beautiful as she was. She was a brave girl who made it through health issues. She was a joy to everyone who knew her, in some way or another. I'm so glad Terry and Pam could be with her at the end. It is truly profound, and, despite the grief, those last moments, knowing she left this Earth enveloped in your love and touch, are a lasting comfort. I'm so grateful that I knew Cami, even at a distance. And despite my grief, I am going to try hard to think happy thoughts, because such a sweet, loving, happy girl should be remembered with joy, not sadness. She is healthy and happy again, and I hope she has met my Wiley. Rest easy beautiful blondie. We'll miss hearing about your adventures. Cami was such a sweet gentle beagle. She touched so many, and she will always be in our hearts. Cami, I remember the day I first saw you. A beautiful white and beige angel with a loving, gentle, and sweet personality. You have given Terry and Pam years of happiness and devotion. Although you are gone, you will not be forgotten. God has a special place in Heaven for you. Rest in Peace sweet girl!! Rest in peace sweet Cami. I wish I had words to lighten your agony, but sometimes words are not enough. May you have memories for comfort. please accept my deepest sympathy on your loss of dear Cami. you are in my thoughts and prayers.